(L-r) SCE’s Flor Tolley and Tammy Tumbling present a check to Aquarium President and CEO Jerry Schubel, V.P. of Development Theresa Duncan and Grants Manager Lindsay Yates. Edison International recently provided a $50,000 grant in support of the Aquarium’s high school education and VolunTEENS programs. At the Aquarium each year about 1.5 million guests, including 200,000 students and teachers, can see as many as 11,000 animals in 50 exhibits. But more than simply a place to observe marine life, the Aquarium has been nationally recognized for its innovative approach to ocean education. This emphasis on science education and environmental awareness is why Edison International has been a supporter of the Aquarium from its beginning. Education and environment are two of the cornerstones of Edison’s philanthropic strategy, along with civic engagement, and public safety and preparedness. To that end, Edison recently provided a grant of $50,000 in support of the Aquarium’s high school education and VolunTEENS programs. “With this support, thousands of high school students from throughout the greater Los Angeles area will have access to hands-on learning experiences and exposure to multimedia and technology-rich education,” said Lindsay Yates, the Aquarium’s grants manager. Edison International began its support of the Aquarium even before its doors were open to the public 16 years ago: It provided funding for the iconic life-size blue whale models suspended from the ceiling of the Great Hall. (The adult and baby whale are nicknamed Edi and Son.) Edison also supported the documentary film, Whales: A Journey with Giants, that is shown at the Aquarium. In addition, Edison has contributed funding programs in two of the Aquarium’s most recent expansion projects: the Molina Animal Care Center and the Ocean Science Center. 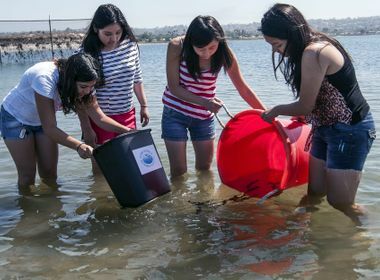 Edison International’s 2014 grant helps fund the Aquarium’s Ocean Science Education Program, which includes educational programs and events for students, teachers and families of Southern California, the majority of which reside within SCE’s service territory. The education program includes the Aquarium Field Trip, a series of K-12 science-based programs for nearly 15,000 high school students every year, such as: an AP-level biology lab on dissolved oxygen; watershed education; squid dissection; and ocean-themed theater presentations. Underserved schools from Los Angeles, Orange, San Bernardino and Ventura Counties receive complimentary admission and education opportunities via a scholarship program. Through the Aquarium’s VolunTEEN program, high school students ages 14-16 learn about marine life and the Pacific Ocean and get hands-on training in education interpretation and public speaking. The VolunTEEN program culminates with the students’ presentation of literary research projects. 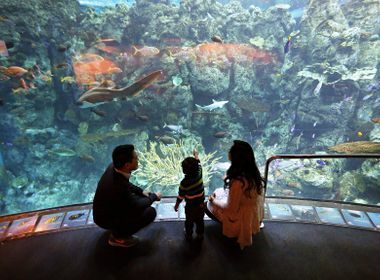 “By creating a place where children and adults are inspired and their love of science is nurtured, the Aquarium can build a foundation for lifelong environmental stewardship and aspirations to become contributing members of the community,” Yates said.